To the casual comic book reader, variant covers may not be that big of a deal unless they’re so visually stunning that they must possess them. But for the diehards out there, they’re all the rage – and the rarer they are, the better. Not surprisingly, the soon to be launched X-Men Gold will have collectors frothing at the mouth with retailer exclusive variants. As you may be aware, it’s Pi Day (March 14, or 3.14, if you prefer) at the time of this article’s publishing, so I can’t help but notice the timing of these specific covers finding their way online. 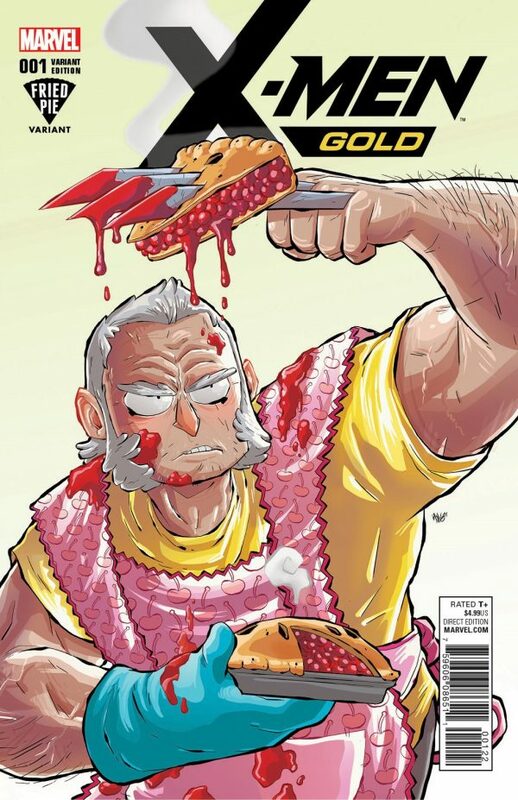 Sure, it’s very possible that it’s all just coincidence, but you must have some appreciation for seeing Old Man Logan – complete with stylish apron – skewering a cherry pie with his adamantium claws on this fine day. That aside, his reason for impaling the fan favorite dessert most likely has to do with who’s offering up this exclusive cover: Fried Pie Comics. Just know that if you’re interested, the colored version illustrated by Ian McGinty will be limited to a run of 3,000. If you want something that will eventually be even harder to find, you’ll want to consider picking up the black and white version at Fried Pie Con 2 on April 15 in Broomfield, Colorado. But this one will be limited to a run of 1,000, so you’ll have to act fast or risk paying a handsome sum on an online auction site. If you’re just looking for a standard copy, however, know that X-Men Gold #1 will arrive in comic shops on April 5.